The compressed earth block so was born in the eighteenth century. Frenchman Jean-François Cointeraux creator of the “new clay” who developped “Crécise,” a brick press adapted from a wine press built on orders from the Minister of the Interior of the Napoleon 1st. In 1952 a manual brick press offered real prospects with the brick press CINVA RAM made by colombian Raul Ramirez. Different models of this brick press is now widely distributed in Africa. The compressed earth block is a mixture of non-plant soil consisting of gravel, sand, and fine particles (silt and clay) and an aggregate binder (cement or lime in many cases). Then a brick press is used to compress the brick. Brick presses come in many ways: manual or motorized, mechanical transmission, hydraulic or pneumatic. The compressed earth block is an environmentally friendly material that can build a house two stories high as long as the compression and earth to be used are appropriate. 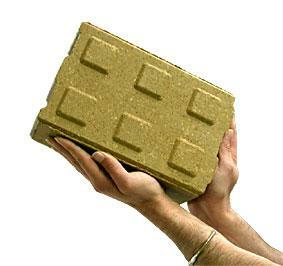 Compressed earth blocks can be used in almost all countries of the world except in very few exceptions. In general earth dug to create a basement is mechanically and chemically capable of being compressed. Given their cost, the vast majority of brick presses are manual. However, the quality of mud bricks is not as good as with a hydraulic brick press because the pressure on the earth is higher and the dimensions of the bricks is the same, which makes wall construction easier and more reliable. Combined with other methods of green building and performance, the properties of the compressed earth block help build the ideal eco-friendly house. Used to fill in a wood frame or an inside wall or surrounding a masonry heater, it will give your home the inertia necessary for perfect temperature control. With good external insulation, a compressed earth block wall has all the qualifications to provide good thermal regulation.